Gerrit Frederickse LANSING (1610 – c. 1655) was Alex’s 10th Grandfather; one of 2,048 in this generation of the Shaw line. Gerrit Frederickse Lansing may have been born about 1610 in Hasselt, Overijssel, the Netherlands. He was the father of the Lansing family – the most numerous family group to live in early Albany. He married Elizabeth HENDRIX in 1636 in Hasselt, Overijssel, Netherlands. About 1640 with their six children, these Lansings emigrated to New Netherland and settled in what became Beverwyck where Lansing was known as baker. Although sometimes confused with his son and namesake, Gerrit Frederickse was dead by October 1679. At that time, he was identified as “deceased” and “in his lifetime,” a “burgher of Hassell.” His widow had remarried and was living in Albany. A more specific senario fixes his death during the 1650s. Alternatively, Gerrit died in Holland prior to 1654, Lysabeth married second Wolter Albertsz van den Uythoff shortly after 31 January 1654. She and Wolter, also a baker, sailed for America in September 1655 with her children by Gerrit. Elizabeth Hendrix was the matriarch of the Lansing family – the largest family group to live in early Albany. She was born in 1615 – Borne, Overijssel, Netherlands. Following the death of Gerrit Frederickse – perhaps during the mid-1650s, Elizabeth Hendrix married another baker, widower Wouter Albertse Van Den Uythoff. They became Albany mainstays in a second marriage that lasted more than four decades. In 1678, Wouter and Elizabeth filed a joint will. She was characterized by the notary as “virtuous” but “sickly.” The will noted that their marriage produced no children but that she had six children from her first marriage living at the time. She was accounted for within the household of Wouter Albertse on the Albany census of 1697. In 1699, Wouter was dead and she was identified as his widow. Willem Ketelhuyn – who took over her husband’s tavern 10 Sep 1693 Albany, NY. With more than 400 family members in the city before 1800, the Lansings are, by far, the largest early Albany family. 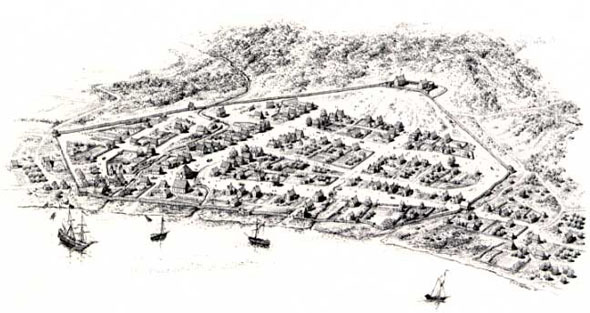 After Beverwyck became Albany in 1664, the Lansings became mainstays in the colonial city, spread throughout the region, then settled across New York and the United States. Today, they are one of the most widespread and broadly successful of the New Netherland-era early Albany families. The Albany Lansings are the descendants of Gerrit Frederickse and his wife Elizabeth Hendrix who came to America with their European-born children about 1640. Within a few decades of settling in Albany, Gerrit Frederickse was dead but three sons and three daughters had found partners and were raising families of their own. The city census of 1697 listed the households of sons baker/contractor Gerrit Lansing, butcher/trader Hendrick, trader/landholder Jan Lansing, grandson Abraham G. Lansing, and also the home of Wouter Albertse Van Den Uythoff – a widowed baker who had married widow Elizabeth Hendrix several decades earlier. Of the daughters, Gysbertje – the wife of Hendrick Roseboom, and Hilletie Ketelhuyn – the widow of Storm Vanderzee, were living in the city. Over the next century, the Lansings spread out in Albany and in the greater region. More so than most New Netherland families, the Lansings maintained a strong and even expanded presence in the city of Albany. The mix of trades, crafts, and business activities of the householders of 1697 was characteristic and became even more diversified through succeeding generations. The Lansings were prominent within the Albany community and more widely known as silver and gun smiths. Middling with some upward mobility, Lansing sons often followed in their father’s footsteps while daughters were well-represented as wives in traditional and newcomer city homes. Thirteen Lansing-named families appeared on the census of householders taken by the British army in 1756. Although the family continued to expand into the growing countryside, in 1790, the census still listed seventeen Lansing-named households in the city of Albany. These included the homes of gunsmith Robert Lansing, baker Sanders Lansing, and businessman Abraham G. Lansing who married the daughter of Abraham Yates, Jr. Always involved in city affairs, the American Revolution elevated the Lansing family to new prominence. Several Lansings attended the Albany Committee of Correspondence as members and associates while others served in the military and on supply lines. John Lansing, Jr., a one-time clerk and secretary, was elected to the New York State Assembly, appointed mayor of Albany, delegate to the Federal Convention of 1787, and later became chancellor of New York State. Robert, Sander, or Jeremiah. However, the historical detective is often thwarted by the fact that so many Lansings were named either Gerrit, Jacob, or John. For example, after Jan Lansing, more than fifty city Lansings born before 1800 were christened Johannes or one of its variants – thus creating perplexing problems in the development of individual biographies. John Lansing, Jr. (the younger – even though he was the son of Gerrit), orJohn 5 Lansing – an innkeeper who was the fifth generation “John” in his particular line. The Gerrits, Jacobs, Marias, and other Lansings pose similar predicaments. More often than most early Albany families – and possibly abetted by the shear size and Albany focus of the family, Lansing cousins frequently intermarried! Elizabeth Hendrix Lansing’s second husband Wouter Albertse Van Den Uythoff was an emigre to New Netherland. By the mid-1650s, he was a widower with at least one child of his own when he married Elizabeth Lansing. He was a baker in Beverwyck and then Albany for the remainder of the century. He was a longtime member and supporter of the Albany Dutch church. 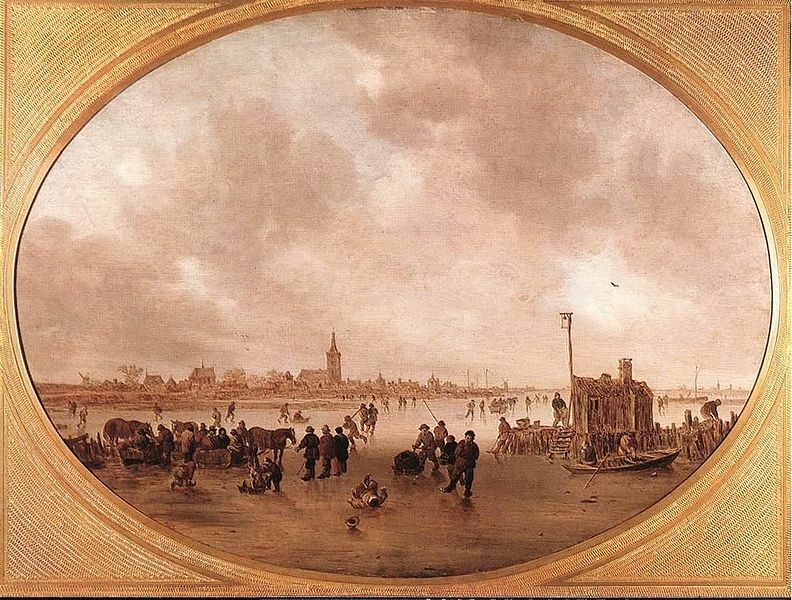 In 1658, he purchased a house and lot from fellow baker Jochem Wesselse – although subsequent court actions were required for Wesselse to secure payment. In 1660, he was among the fur traders who petitioned for more liberal trading policies. Over the years, he occasionally appeared before the Albany court as principal, witness, attorney, mediator, and juror. He also bought and sold real estate in Albany. In April 1676, the Albany court called him “Wouter de Backer” when it appointed him a carman. In June 1678, Wouter Albertse and Elizabeth Hendrix filed a joint will. It named his six step-children. A year later, his home was included on a census of Albany householders. Wouter and Catherine owned a house lot and Bowery #10 in Schenectady. 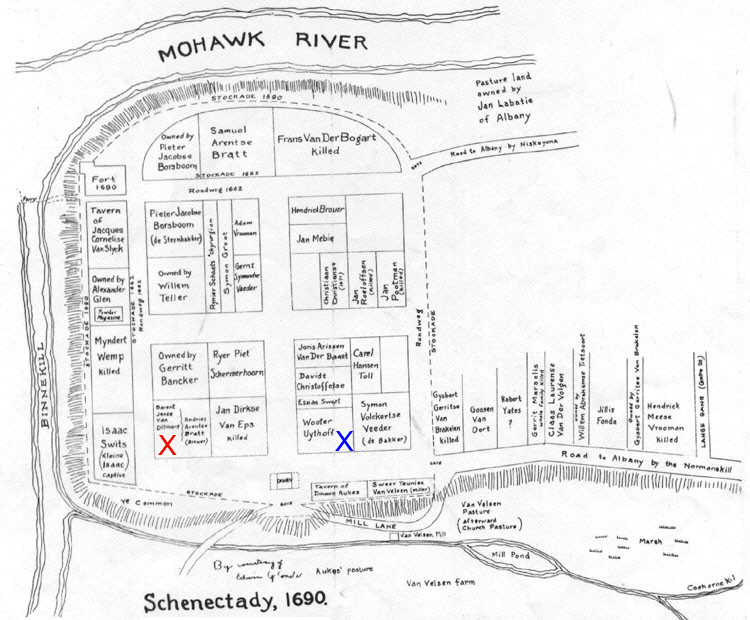 The town was destroyed and its people killed or kidnapped in the Schenectady Massacre of Feb. 08, 1689/90. See Andries Arentse BRADT’s page (Hilligien LANSING’s father-in-law) for details. I haven’t found how Catherine and Woulter fared. The double bouwery No. 10, was first patented to Teunis Cornelise Swart, June 16, 1664, and confirmed Jan. 16, 1667. Patents, 309. Elizabeth, widow of Teunis Swart, then wife of Jacob Meese Vrooman, of Albany, Feb. 20, 1685/6, conveyed to her son Jesaias Swart, eight acres of land out of this farm to be taken from the extreme south end. Deeds, III, 310. 26th April, 1692. Wouter Uythoff (third husband of Elizabeth), and said Elizabeth his wife, for 540 beavers conveyed the whole bouwery No. 10, to Claas Laurense Van Purmerend (alias Van der Volgen). Deeds, IV, 35. Jan. 4, 1692/3. Claas Laurense Van Purmerend sold to Claas Janse Van Boekhoven for 147 pounds the half of farm No. 10 lying between the highway and the river, — eleven morgens. Deeds, IV, 34. And Jan. 5, 1692/3. Claas Janse conveyed to Dirk Arentse Bratt, his stepson for 73 1/2 pounds, five and one-half morgens of the above purchase, being the easterly half of that portion lying north of the highway. Deeds, IV, 38. On the same day, to wit, Jan. 5, 1692/3, in consideration of a sum of money paid him by Catharine Glen, sometime widow of Cornelis Barentse Van Ditmars, eldest son of Barent Janse Van Ditmars, Claas Janse Van Boekhoven conveyed to said Catharine Glen (and as her dower), now wife of Gerrit Lansing, Jr., a piece of land out of farm No. 10, being the westerly half of that portion lying between the highway and the river — consisting of five and one-half morgens.Deeds, IV, 37. In 1697, Wouter and Elizabeth were alone in their second ward home. In July 1699, Wouter Albertse was identified in the city records as the deceased husband of Elizabeth Hendrix. In that year, he joined in swearing allegiance to the king of England. After 1699, his name dropped community rolls. 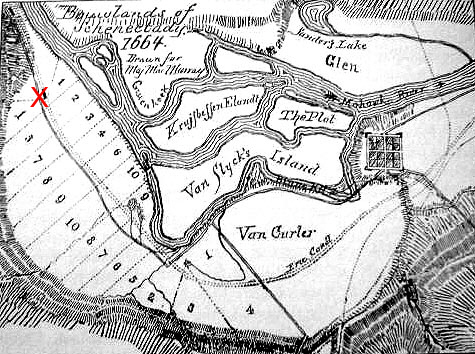 Aeltjen’s husband Gerritt Van Slick Ten Horst ( Van Schlichtenhorst) was born 1635 – Nijkerk, Gelderland, Netherland. His parents were Brandt (Arent) Van Slichtenhorst and Aeltje (Gysbrecht) Van Wenckum. Gerritt died 9 Jan 1684 – Kingston, Ulster, New York. Gerrit’s first wife Elsie Van Wythorst was born 1630. Her parents were Wouter Van Wythorst and [__?__] . Elsie died in 1690. Some sources say she was Elsie Van Den Uythoff, the daughter of his mother’s second husband. Jan. 5, 1692/3, in consideration of a sum of money paid him by Catharine Glen, sometime widow of Cornelis Barentse Van Ditmars, eldest son of Barent Janse Van Ditmars, Claas Janse Van Boekhoven conveyed to said Catharine Glen (and as her dower), now wife of Gerrit Lansing, Jr., a piece of land out of farm No. 10, being the westerly half of that portion lying between the highway and the river — consisting of five and one-half morgens.Deeds, IV, 37. Hendrick’s wife Lysbeth Casperse Hallenbach was born 1650 in Albany, Albany, New York. Her parents were Caspar Jacobse Hallenbeck and Lysbeth Hoffmeyer. Lysbeth died 1713 in New York. By 1679, Hendrick was identified as an Albany householder. For the next three decades, he was a pillar of the Albany community – serving on juries, acting as surety, and appearing in cases before the Albany court. Like his brothers, he was a fur trader whose property ranked him with other middling Albany businesssmen. In 1697, his second ward home was configured on the city census – next to that of his mother and step-father. Two years later, he joined with other Albany mainstays in signing a loyalty oath to the King of England. Jan’s wife Geertje Goosense Van Schaick was born 1649 in Albany, Albany, New York. Her parents were Goosen Gerritse Van Schaick and Geertje Van Nieukerke. Geertje died Dec 1739 in Albany, Albany, New York. He was the first of more than fifty early Albany people to be named John Lansing. Jan was a fur trader who was able to amass a considerable fortune while still a young man. By 1679, he had established his own residence within the Albany stockade following his marriage to Geertie Van Schaick, the widow of Hendrick Coster – who brought with her several growing children. Over the next two decades, their household on Pearl Street grew again with the birth of six Lansing children. Jan Lansing was one of Albany’s city fathers – being appointed one of the original assistants by the governor in 1686. Two years later he was elected as alderman to represent the second ward on the Common Council. Except for the hiatus of 1689-90, he served on the council until 1698. During that time, he sat on a number of committees and courts and regularly performed contract duties. As his children grew into adulthood, the city-based Lansing continued to prosper and invested in real estate. By the early 1700s, Jan Lansing was one of the wealthiest Albany merchants – as his property was among the highest valued on city assessment rolls. A lifelong Reformed church member, Lansing served on the consistory and was actively involved in church business. In 1715, he joined a number of European-born Albany people who became naturalized British subjects. Living on into his eighties, Jan Lansing died in February 1728 and was buried under the Dutch church. This entry was posted in 12th Generation, Immigrant - Continent, Line - Shaw, Pioneer, Place Names, Tavern Keeper and tagged Albany Pioneer. Bookmark the permalink.